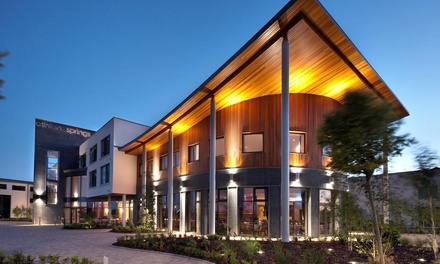 Sitting on the outskirts of Athlone, the Athlone Springs Hotel greets visitors with four-star facilities, just a 15-minute drive from the wilderness of the rustic banks of Lough Ree. For outdoor leisure, guests may stroll around Athlone town, while the surroundings beckon with countryside walks. The hotel boasts an array of rooms that come dressed in warm colour schemes, rich wooden furnishings and fitted with LCD TVs and en suite facilities. At Cedar Restaurant guests can browse seasonal menus and dishes ranging from roast crown of turkey and honey roast ham to pan-fried pork cutlets, while the bar offers lighter bites, cocktails and all kinds of alternative tipples. Those feeling indulgent can stay indoors and test out the pool, sauna and steam room. Athlone is located in County Westmeath, on the River Shannon, approximately 9 kilometres from the geographical centre of Ireland, and is bordered to the north by Lough Ree. Athlone makes for a suitable base from which to explore the Lakelands and the inland waterways as well as an array of heritage sites including Athlone Castle, which dates back to the 13th century, Derryglad Folk and Heritage Museum with its display of farm and folklife items. Those who appreciate outdoor activities can enjoy walking, cycling and golfing opportunities. Cancellation Policy: Bookings can be modified up to 72 hours in advance, subject to availability. No cancellation allowed after booking confirmation. Bookings are non-refundable and non-transferable to another destination once confirmed. Validity: Valid until 31 May 2019. €25 surcharge applies per night for Friday stays. €35 surcharge applies per night for Saturday stays. Late check-out is not available on Saturdays. Price for 2 people. Booking: Please book within one month of purchase. Mandatory booking required. Check availability before booking.